The movie's remarkable climax: the British orchestra plays on despite the rebel attack reducing their building to rubble. Kenneth Willams (standing), a mainstay of the best Carry On movies. Underwear was a vital feature of the film's plot. Khyber was perhaps the most cinematically spectacular of the Carry On movies. Missionary attempting to save souls in Afghanistan. Religion was not usually a target of Carry On comedies. 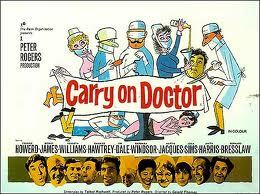 Thirty Carry On movies were made during the period from the late 1950s to the late 1970s. A Welsh farm valley stands in for the Khyber Pass. Up the Khyber was possibly the best of the thirty (or thrirty-one) films that made up the famous -and profitable - British comedies series that stretched from the late 1950s to the 1970s. The films show the influence of British music hall comedy, pantomine traditions, comic stereotypes dating from Aristophanes and a willingness to mock British institutions and manners.They also parodied film genres: westerns, horror, James Bond. They were made very cheaply. Khyber's exteriors were shot in Snowdonia, Wales, which effectively represented the Khyber Pass. 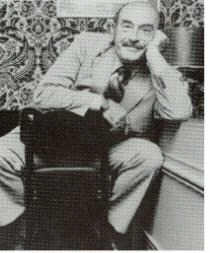 Talbot Rothwell scripted most of the Carry On movies.A former RAF pilot and prisoner of war, Rothwell loved the Music Hall of his youth, and its features of risque and sexist humour, jibes at social and intellectual pretension, and gentle derision of English instiututions, as well as their love of puns were carried over into his Carry On scripts.But as he noted, "Nobody ever actually swears and nobody ever actually gets into be with anyone else". Khyber shows Rothwell's talent for situational and verbal comedy as its best. The front row shows many of the series' key cast. From left, Barbara Windsor, Sid James, Joan Sims, Kenneth Williams, Kenneth Connor. Most of these actors shared a background in early postwar radio comedy, music hall and television comedy. Carry On Historian: Has the Movie Any Factual Basis? The Highlanders in action on the North West Frontier. 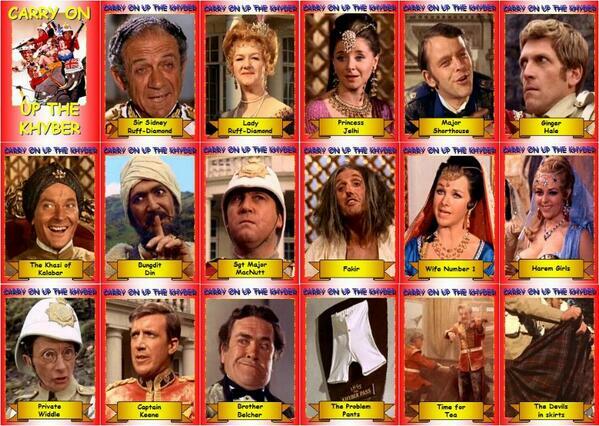 Although the characters in Carry On Up the Khyber are all fictional, the actual historical context that is the basis of the film is accurate.The film is set in 1895. During that year there were two major battles between British forces in Afghanistan and Pathan (Pashtan) tribesmen: the battle of Chitral and the battle of Malakand Pass. Thus same area was the focus of conflict between Russian forces and tribesmen in the early 1980s and remains an area of contention between Taliban and US forces in the early 21st Century. The kilt-wearing Gordon Highlanders played a key part in the 1855 conflict, with the regiment famously winning the India Medal and two Victoria Crosses in the Chitral battle. 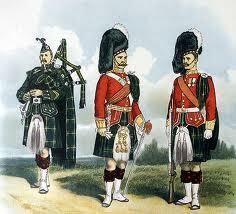 In one famous incident, the Regimental Piper was shot in both legs, so he sat down and piped his troops into battle. The tribesmen also used similar tactics to those depicted in the movie i.e. surrounding a British garrison town and trying to overrun it. Carry On Up the Khyber shows that the rebels were deceived rather than defeated militarily. They simply went away. In history too the rebels 'lost' but were hardly defeated. They too returned to their mountains and resumed their campaign a couple of years later, and again the Gordons had to repel them. See Tribal Analysis Center and Heritage History. Gordon Highlanders with Regimental Piper. Aristophanes of Athens, who wrote his ribald comedies in the 5th Century BCE. Carry On Up the Khyber and the other movies in the Carry On series is separated by two millennia from their earliest models for comedy. In the late late fifth and early fourth centuries BCE the Athenian comic dramatist wrote many comedies that established a template using some elements happily reinvigorated by the Carry On team.These included a reliance on farce, and bawdy humour, and stereotyped characters, as well as attacks on Athenian institutions, and social manners. Aristophanes, however, savagely satirised the politicians and prominent citizens (like Socrates) of his society, unlike Carry On movies. His most famous comedy, still staged frequently today, was Lysistrata, where a group of women, angry with their menfolk for continuing a long and bloody war,withhold their sexual favours in order to make their husbands see sense. The issues of British military presence in foreign countries, and of British military competence, are investigated by the movie with sufficient vigour for it to have be banned from being screened on British television during the first Gulf war.